Universal DAB and hands free solution for iPhone and smartphone users! 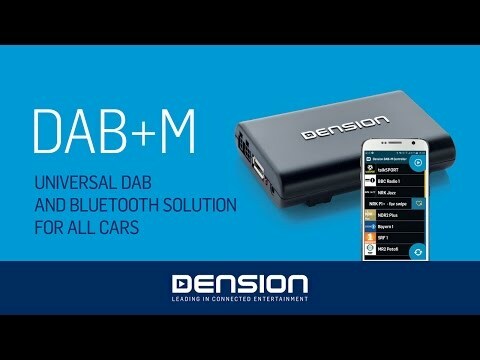 The Dension DAB+M not only enables digital radio in your car but also offers hands free and music streaming functionalities. Take control easily: via your phone or optionally with a remote controller for the full home experience. Update and install your device simply, manage DAB stations, save your favourites. Just download our DAB application and you’re set! App controlled DAB device for your car? You got it! This is where the available DAB stations are listed in alphabetical order. You can even arrange a favourites list! All the information here is sent by the currently played DAB broadcaster, additionally you can also see the station’s logo. Here you can set frequencies manually or automatically then switch to the desired one with your radio. An easy to handle menu designed for car drivers. Video about installation and usage of the Dension DAB+A and DAB+M.